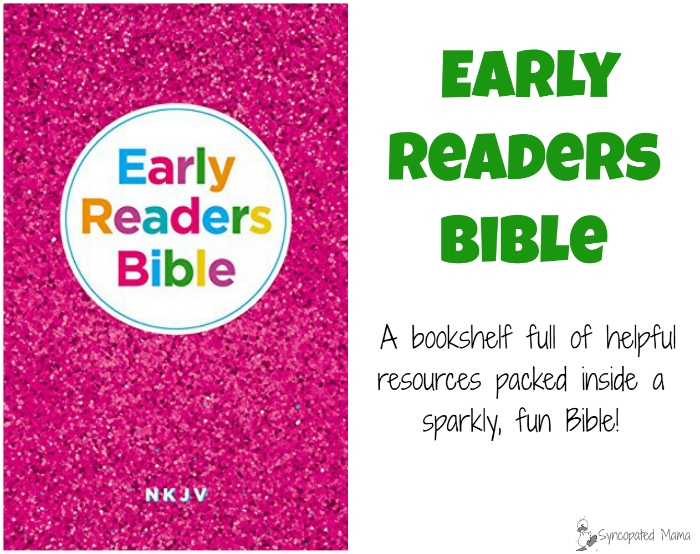 A bookshelf full of helpful resources packed inside a sparkly, fun Bible! "Ooooohhh, what is that?" she exclaimed as she pounced on my lap, reaching for all those sparkles. 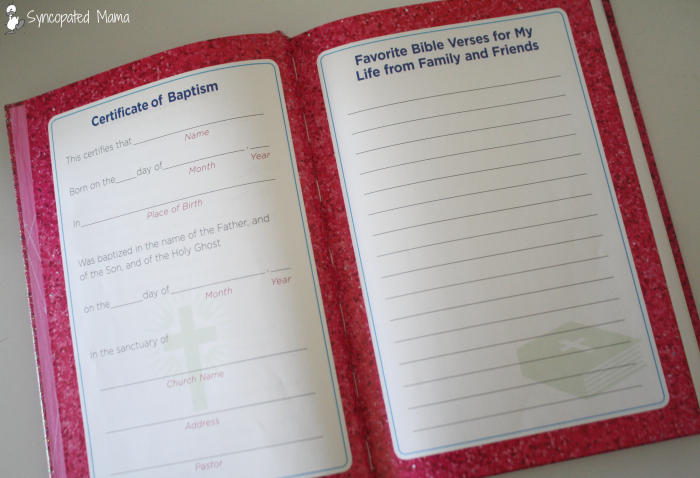 "Early Readers Bible," she read. "Hey! That's me! It's a Bible for me!" She began to excitedly flip through the pages, but I quickly sent her scampering off with a "Hold on -- let me review it first, then it's all yours." 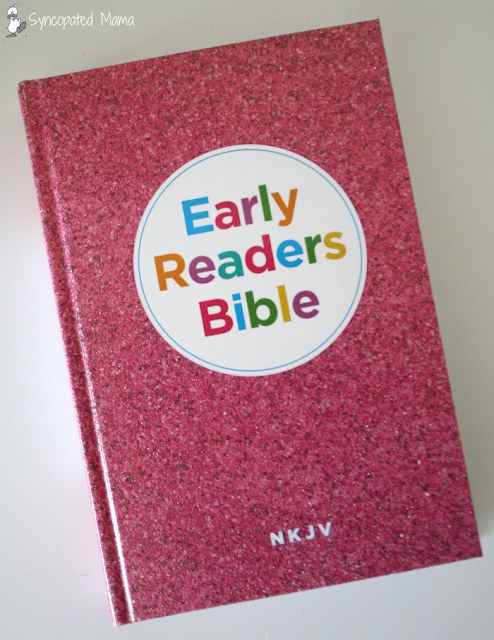 I was excited about this Bible -- not for its attractive cover, but for the "Early Readers" designation. Although we love our storybook Bibles and will surely keep reading them for many years, Gv's now at the point where she can begin reading the real Bible for herself. I thought this one would be the perfect transition for these early-reader years. Once I flipped the cover open, however, my heart sank. Although the text is a bit bigger than that of a typical Bible, it's still much smaller than the early chapter books Gv is currently devouring. Also, the text is straight NKJV, which I guess I was expecting to be modified a bit, to make the vocabulary easier for younger readers. However, I quickly got over my disappointment with the readability of the text once I started flipping through the pages from the beginning. 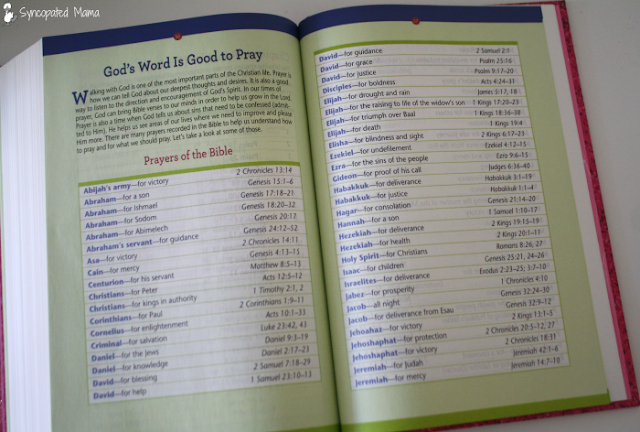 This Bible may not be what I was expecting, but gosh, it is bursting with extras that will help kids (& their parents!) better understand what the Bible is all about! 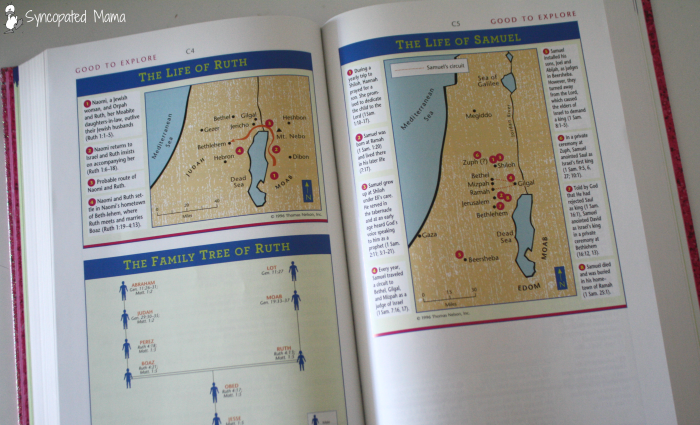 There are all the usual maps and charts that you'll find included in most every Bible (books of the Bible, Paul's missionary journeys, etc. ), but I was shocked to see how many other study helps these pages included. 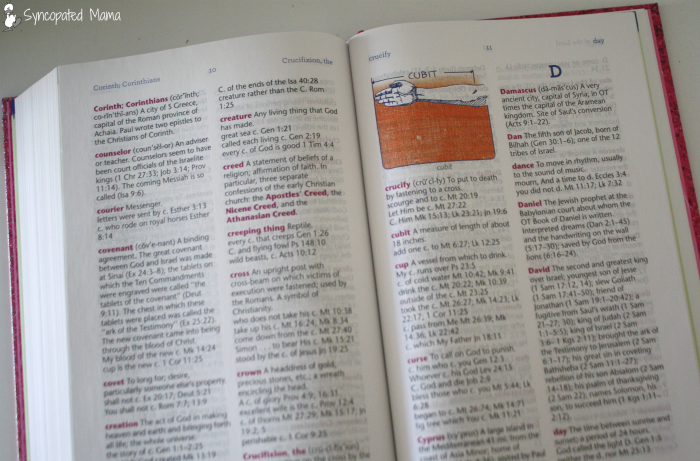 Bible Background: What is the Bible? Who wrote it? How did it come to be? When did it happen? Studying the Bible: How to do it, how it teaches us character, fun ways to study it with friends. 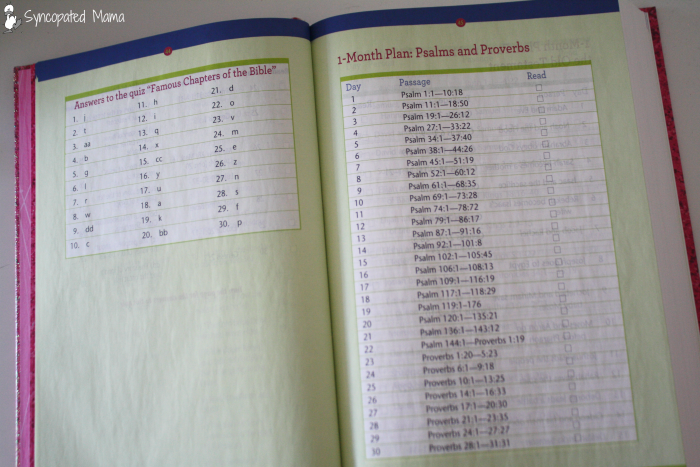 Prayer: Prayers of the Bible, how others can pray for you, pages for journaling. When did biblical events happen? 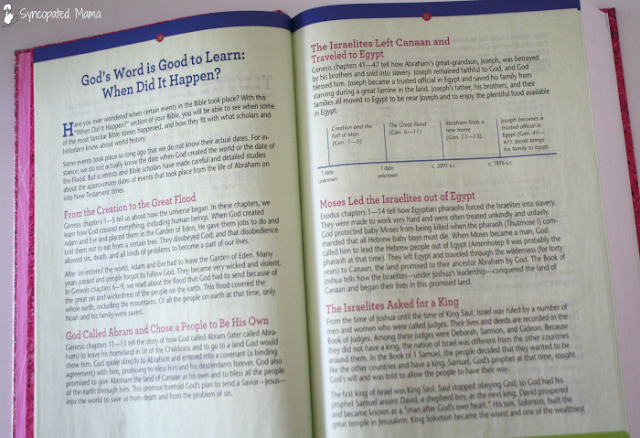 Then, the books of the Bible follow, interspersed with six sections of colorful, stiff pages that provide further background information, maps and pictures and will make the Bible come alive for young readers -- there are even fun quizzes to check how well all that new knowledge is sinking in! 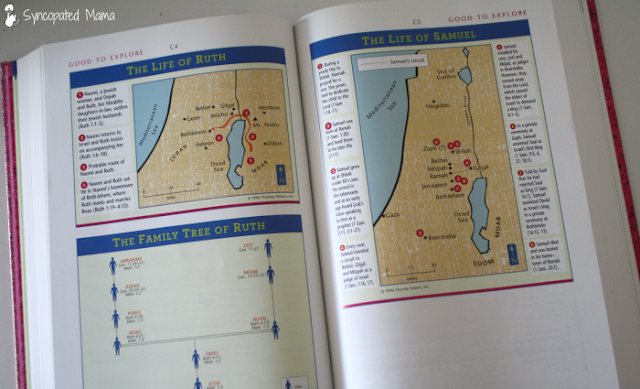 Maps and chart from one of the middle sections. Another set of extra information from one of the middle sections. 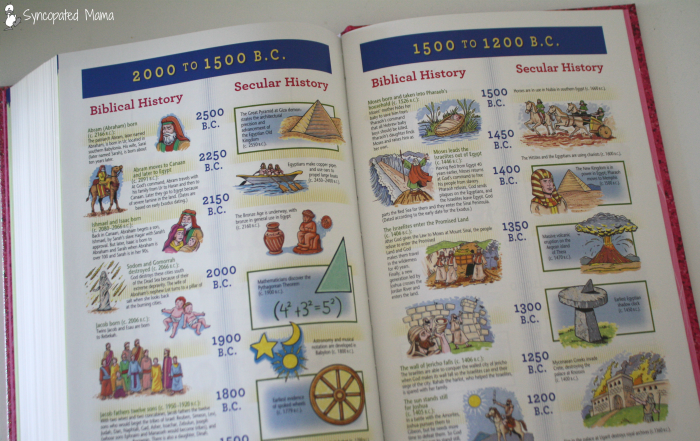 Finally, the Bible concludes with a section titled "Time Lines of Biblical and Secular History," which is something every Bible reader can appreciate. It not only places biblical events in chronological order, but shows what was going on in "other history" as well. Biblical and secular time lines, side-by-side. I'll enjoy these pages just as much as Gv will! So despite my initial disappointment in this Bible, I am excited to add it to our collection. Gv's still mostly enamored with the glittery cover, but I can see her spending plenty of time pouring over all the maps and other extras, as well. I definitely recommend this Bible, but just realize that you'll want to get it for all its extras, rather than any adaptations to the text for young readers. 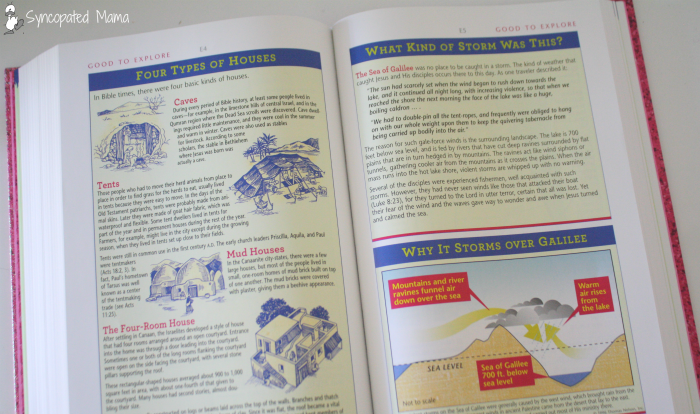 Pick up your own copy here and provide your early Bible readers with loads of resources to make their learning a fuller experience! Do you think a Bible like this would be helpful in your house? I'd love to hear! Either leave a comment below or email me at lisahealy (at) outlook (dot) com.